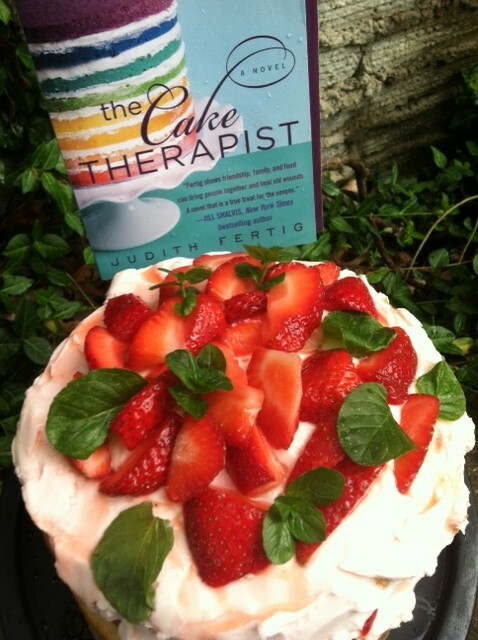 What can a little cake therapy do for you? When I was writing my debut novel The Cake Therapist (at the same time as my new cookbook Bake Happy), I had an “aha” moment. What if my heroine could help people solve their thorny life issues—with cake? Cake that comforts, cajoles, gives us cajones. Cake takes us back to a sunny summer day and unlocks the door to the past. That cake. For some more cake Therapy, and for the recipe for the beautiful Rainbow Cake, check out Judith’s blog. Another dessert expert, Linda Lomelino, has a beautiful book of cakes: Lomelino’s Cakes. All the cakes within are stunning, impressive, visually beautiful and amazingly delicious desserts. See below for the full recipe for this gorgeous Pavlova. 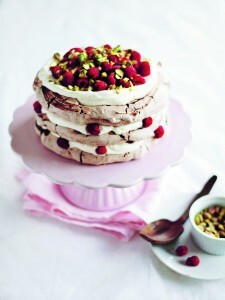 This meringue cake with chocolate, cream, raspberries, and pistachios is magnificently sticky and crispy. When the cake is finished, refrigerate it for a few minutes to make it easier to cut the layers. This cake should be made the same day it will be served. 1. Break the chocolate into small pieces, and melt them slowly over a double boiler (see page 10) or in the microwave. Let cool. 3. Cut a piece of parchment paper the size of your baking sheet. Then, cut out or find a circle template about 6 inches in diameter. Place the circles as far apart as possible on the parchment paper without touching the edges; trace. Turn the parchment paper over, and lay it on the baking sheet. These circles will indicate the placement of your meringue. 4. In a clean, dry bowl, beat the egg whites until soft peaks form. Add the sugar gradually, and continue beating to a thick meringue. You should be able to tip the bowl without the meringue sliding out. 5. Sift the cocoa powder and cornstarch into the meringue. Add the vinegar, and blend until the batter is smooth. Add the melted chocolate, and stir gently. 6. Divide the meringue among the paper circles. The meringues might shift during baking. Put the baking sheet into the oven, and lower the heat to 250°F. 7. Bake the meringue for 60–75 minutes. The baked layers should be hard and crisp around the edges but still sticky in the center. Turn off the oven, leaving the layers in the oven with the door propped open until the oven has cooled. 1. In a dry, clean bowl, whip the cream until it thickens. 2. Chop the pistachios. Rinse and dry the raspberries. 1. Place the first cake layer on a cake plate. Spread one- third of the Whipped Cream Frosting on the top, and sprinkle on a few raspberries. Repeat with the next layer. Place the third layer on top. 2. Top the cake with the remaining Whipped Cream Frosting, and then add the remaining raspberries and all the chopped pistachios.